Quick Changemandrel (PCM38) with one pilot bit (HB85PB). One small adapter (AN01) and one large adapter (AN02). Hole saws: one 1 In. , one 1-1/2 In. , one 2-1/8 In. and one 2-1/2 In. .
PCM12AN 3 Universal Quick Change™ mandrel kit (1) 7/16" mandrel, (1) small adapter for hole saw sizes 9/16"-1-3/16", (1) large adapter for hole saw sizes 1-1/4"-6"
CK2 6 Quick Change™ conversion kit (2) small adapters for hole saw sizes 9/16"- 1-3/16", (4) large adapters for hole saw sizes 1/4"- 6"
HE1 2 Hole enlarger kit This kit makes it possible to expand holes in tight retrofit situations, door lock installations, and for conduit fitting. 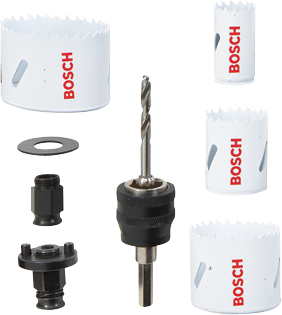 PCM38AN 3 Universal Quick Change™ mandrel kit (1) 3/8" mandrel, (1) small adapter for hole saw sizes 9/16"-1-3/16", (1) large adapter for hole saw sizes 1-1/4"-6"